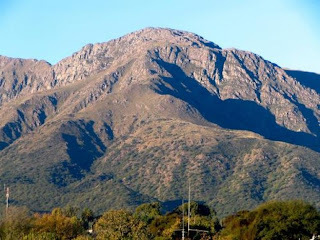 VILLA CARLOS PAZ, ARGENTINA - The UFO phenomenon has not ended over the mountain ranges of Cordoba and the world's attention is drawn once more to the phenomenon after a couple of tourists from Buenos Aires and a businessman claimed having taken photographs of possible sightings. The first of these cases took place weeks ago in the locality of Capilla del Monte; the second involved a real estate agent from the town of Mendiolaza, who also claims having recorded the movement of a flying object in the sky. According to the images displayed on the C5N television channel, the photos taken at Valle de Punilla show a black spot over Mount Uritorco which prompted investigation by a local UFO group. Meanwhile, an image circulated through several Internet portals, taken by a real estate salesman, who claims having detected "a spaceship" as he downloaded a photograph of a property for sale. These last two cases are added to the number of stories that attribute the properties of an "intergalactic portal" to the region, a point of constant access for vehicles. The fact is that the mountain ranges hold magnetic properties that make them a unique enclave, according to those who specialize in this type of research and who study the collected materials. Dr. Anthony Choy comments on the Peruvian "Mothership"